The CGIAR Research Program on Dryland Systems is part of the global effort to tackle poverty, hunger, and environmental degradation. We work to deliver results on the ground by designing research-in-development activities that contribute to reducing rural poverty in drylands, increasing food security, improving nutrition and health, empowering and providing new opportunities for women and young people in agriculture, and sustaining the management of natural resources in an equitable fashion. Our approach is to tackle grand dryland challenges on a large scale, aiming for clear outcomes and focusing on people, results, and efficiency. Our program results framework aligns with the new direction of the CGIAR Strategy and Results Framework 2016–2025, and responds directly to the proposed United Nations post-2015 Sustainable Development Goals. Our program calls for collective action among all partners and stakeholders to engage in integrated systems research that focuses on distinct development goals. In doing so, we seek to identify the most innovative and sustainable solutions with benefits that reach far beyond the original problem. IMPROVE FOOD AND NUTRIENT SECURITY FOR HUMAN HEATH (SLO 2): making an impact means research to increase food and nutrient security, thereby improving human health for poor and vulnerable communities in drylands. 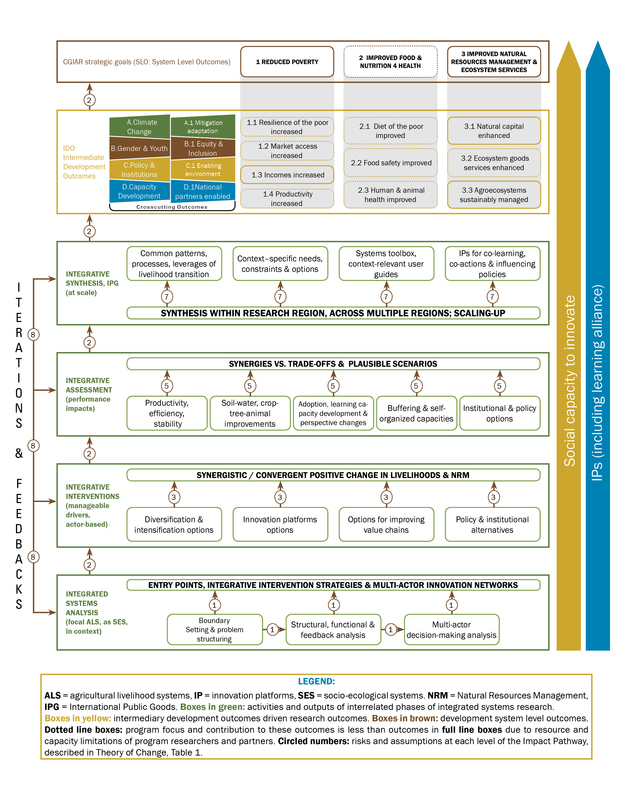 IMPROVE NATURAL RESOURCES MANAGEMENT AND ECOSYSTEM SERVICES (SLO 3): making an impact means research to develop an equitable and sustainable management of land, water resources, energy, and biodiversity in drylands for generations to come. GENDER AND YOUTH (CCO B): making an impact means research to promote and promote gender equity – that is, it is research is adapted to meet the needs and the aspirations of women and young people as key vulnerable groups and provide empowerment and better socio-economic opportunities, including youth employment in agri-food supply chains. POLICY AND INSTITUTIONAL INCENTIVES (CCO C): making an impact means research to improve institutional and policy incentives to increase sustainable agricultural production, natural resources management and resilience to climate and other unexpected global changes. CAPACITY DEVELOPMENT (CCO D): making an impact means research to improve the capacity of the community of practice in agri-food and livelihood system research, and enhance innovation throughout the agri-food and livelihood systems, including farmers and other vulnerable groups along food value chains. 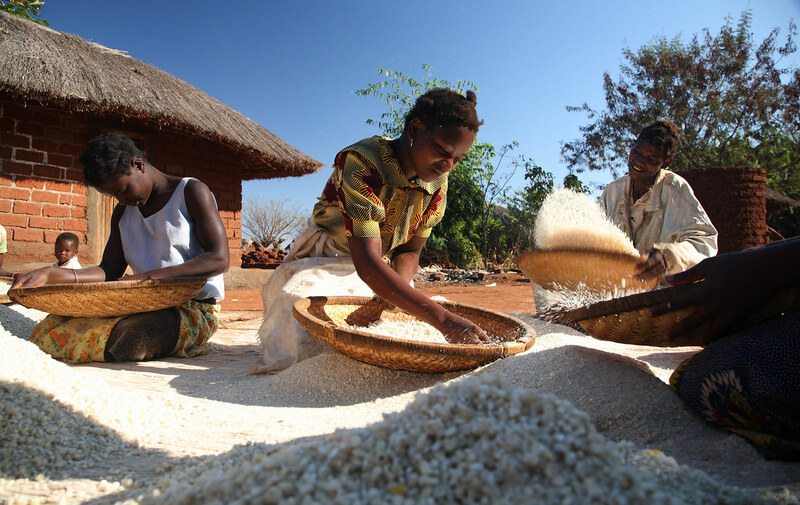 The intermediate development outcomes are shaped by the research evidence we produce in the form of Intellectual Property Goods that include, but are not limited to, improved crop varieties, better farming methods, innovative technologies, incisive policy recommendations, geospatial databases, and a wide variety of knowledge repositories and data tools. Our research outputs are freely available to local, national, and international stakeholders in both the public and private sectors. These groups transform our research outputs into products tailored to the needs of rural dryland households in developing countries. We are not starting from scratch because we use data and information gathered previously (‘back casting’) to draw out conclusions that guide the development of appropriate models of interventions. This will help cut the lead-time to achieve development impact. Our research activities are aligned with local, national, and regional priorities to ensure that we deliver research outputs that are of relevant scale and value. We design research activities to contribute to achieving global impacts on poverty and hunger among millions of marginalized men, women, and children living in rural drylands. The program has a wide upstream and downstream reach that includes partners and institutions with a key role in defining the drylands development agenda. In parallel with providing scientific leadership on drylands issues at a global level, the program advocates strongly for greater research and investment in drylands to advance national and regional priorities. By working with a diversity of local, national, and international partners, we also enhance knowledge, skills, and capacities to catalyze collective action among stakeholders for greater development impact in drylands.